Cacophony of noises or a pleasant shopping and dining experience? 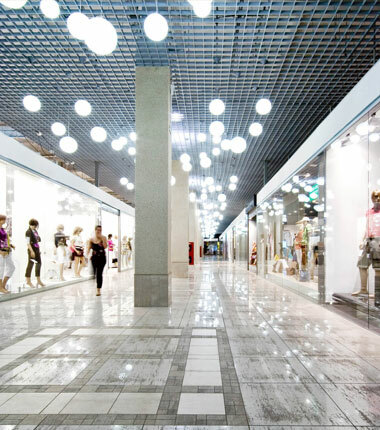 Let the shoppers prefer an acoustically pleasing mall! Shopping can be very stressful especially if there is a product launch or fashion show in the atrium which then becomes cacophony for the rest of the mall. Also a crowded food court is usually always a noisy experience whereas quiet environs are preferred to converse and enjoy a meal. Malls are designed with highly polished and acoustically hard surfaces. The emphasis is on visuals and visuals only. This tends to create highly reverberant spaces that unwittingly create stress, the last thing that brands would want! If the necessary awareness and consciousness exists at the design stage itself then acoustical ceiling panels like Snazz Pixel 3/8 or Snazz Cosmos can be very easily integrated by architects in the usual smooth gypsum ceiling with no loss to aesthetics. Similarly atrium domes can be adorned with Subtex Wave acoustical baffles that can work as colourful banners too. Imagination and innovation is the key! Experience shows architectural acoustics is most neglected in malls by interior designers and hence acoustical ambience can become a mall’s key differentiator to the delight of the owner, tenants and most importantly, the shoppers, making them come back again and again. Once there are a throng of repeat footfalls and merchandise flies of shelves the lease rentals can be robust and sustained. A win-win-win for all stakeholders.